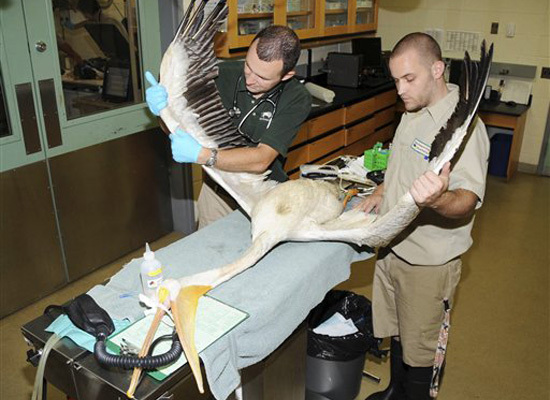 Last month's arrival at Chicago's Brookfield Zoo of five American white pelicans rescued from the Gulf Coast oil spill had us wondering if there's actually an urban zoo that only exhibits animals affected by man-made disasters. Instead of showcasing the planet's marvelous natural beauty and ecological diversity, it collects living artifacts from sites of disturbances, where culture messily intersects with the wilderness. If no such zoo exists, it's easy enough to speculate one. In addition to refugees from the Gulf Coast oil spill, it would also house samples of local fauna affected by other large oil spills, including the one in Dalian, China, koalas saved from bushfires, elephants displaced by civil wars, gorillas smuggled out during outbreaks of genocide, and tropical birds caught in the crossfires between loggers, indigenous tribes and the Landless Workers' Movement. In other words, it's not only environmental destruction that's being catalogued here but also its accompanying social violence and human strife. Of course, the animals needn't be endangered. It could be any common critter as long as it bears witness to a major news story. So if it was rescued from the diamond mine where Naomi Campbell's “dirty stones” were dug out, then it's taken in. In this way, this animal sanctuary isn't something dreamt up by Jack Hanna or David Attenborough but perhaps by CNN or NPR. Walking around, you don't pass by living dioramas with names like The African Savannah or The Amazon Rainforest. Rather, these simulated environments are headlined as one would a front page news article. A day at this zoo would be like watching an episode of The PBS NewsHour. The Randall Museum in San Francisco bears some resemblance to what you describe.